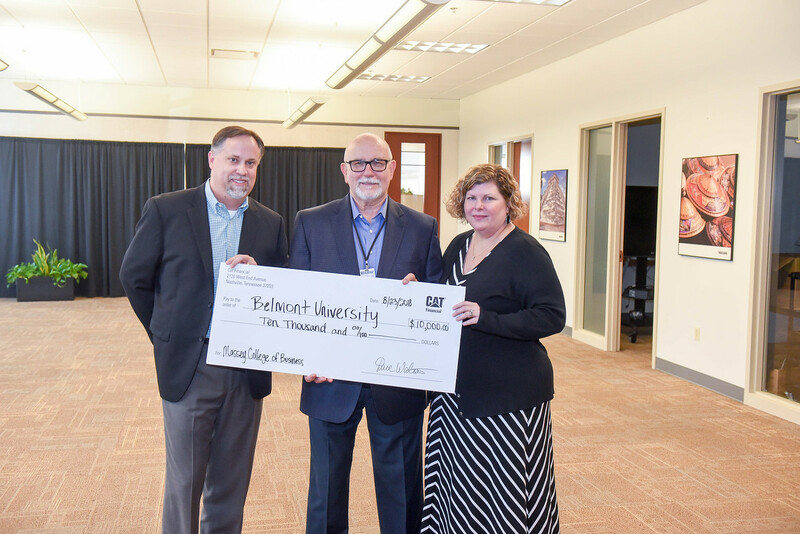 A gathering of Belmont alumni was recently held at Caterpillar Financial, and during the event Belmont was presented a check for $10,000 from the Caterpillar Financial Contribution Fund to benefit the Jack C. Massey College of Business. The money will be used for a seminar on Global Career Readiness in the Spring co-hosted by the Center for International Business and the Massey College of Business Career Development Center. Headquartered in Nashville, the finance and extended protection solutions company employs more than 75 graduates from the Massey College of Business. With approximately 1,000 employees in the West End Avenue building, Belmont graduates represent nearly eight percent of the workforce.